The camp was led by Shihan Uchida and all students and Instructors are thankful for his instruction, guidance and leadership. 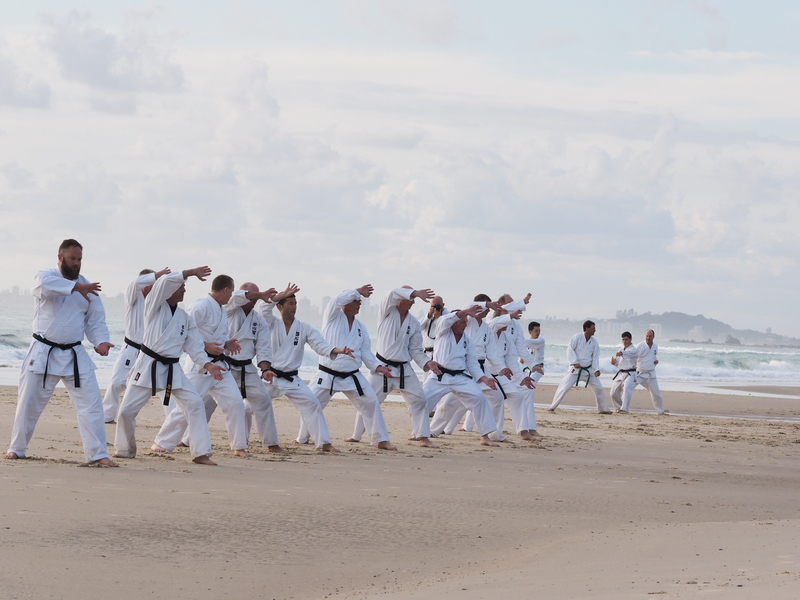 Members of Kei Shin Kan dojos from around Australia attended the camp. Members came from Sydney (NSW), Melbourne (Vic), Hobart & Launceston (Tas), Broken Hill (NSW) and Gold Coast (Qld). Training commenced on Friday night with exercises and basic training. The session challenged all members as it was both physically and mentally demanding and a great preparation for the weekend. Saturday morning training started at 6am on the beach. This was a great opportunity for students to train in an environment they ordinarily were not use to. There were 3 training sessions during the day which covered technique, footwork, combinations, kata, controlled sparring and kobudo. To add to a full day, a Kata and Kumite tournament was also held on Saturday. This was followed by a seminar led by Shihan Uchida on the history of Karate and Kei Shin Kan’s historical roots. Sunday morning training started at 6am. Again, this included basics, combinations and technique training. Each State also gave a demonstration. The junior Gold Coast Kei Shin Kan members treated camp members to a special set of demonstrations. The demonstrations clearly showed the commitment and hard work of the students and their instructions. The finals of the Kata and Kumite tournament were held during the final training session as well as a black grading. Official training finished at 12.30pm Sunday with a presentation of trophies to the tournament winners. The weekend was a great opportunity for everyone to train and socialise together. It was also a chance for everyone to strive for improvement physically and mentally and to further technique and application. We thank Shihan Uchida again for providing guidance, knowledge, leadership and encouragement to all of us.